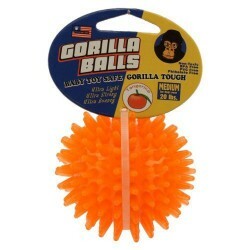 Product Details - Material- Rubber , Suitable -Medium Breeds, Dimensions - 7 cm, Use-Massages Teeth and Gums. Product Information - Petsport Gorilla Ball Small. Baby Toy safe- BPA, PVC and Phthalate Free. In 4 Assorted sizes, colors and flavors for all pets. Bounce Float Stretch Fetch Ultra Light, Ultra Strong, Ultra Bouncy. Massages Teeth and Gums. Non-Toxic.